*Sorry I haven't been around commenting much the last week or two. I've been out of town. I just got home and will try to start catching up on my blog reading. Here's a story of being lucky. Well, lucky and resourceful. 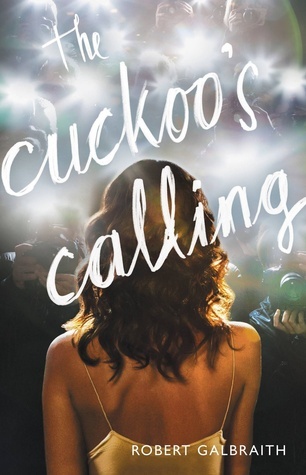 I saw a headline on Hypable last Saturday afternoon that J.K. Rowling had released The Cuckoo's Calling under the pseudonym Robert Galbraith. Immediately, I got on my library's website to see if they carried the book. They had four copies. Even better, there was only one hold. I put my number down and became hold #2. Fast forward a few days and there were over 250 holds on The Cuckoo's Calling. So just when everybody is clamoring after the book, I have a copy! After that long-winded, self-congratulatory introduction, you're probably wondering what I actually thought of the book. I liked it. With a few caveats. I don't really like mysteries and I've never been into detective driven novels. So that colors my opinion of the book. It's not Harry Potter. I wasn't expecting it to be nor do I imagine most people are after Casual Vacancy. The Cuckoo's Calling is an adult book. It lacks the underlying hopefulness and redemption of Harry Potter. Everything feels very cynical. That's not a bad thing necessarily. It's just different. Oh, and J.K. has a real fondness for the f-bomb. Not quite as much as in Casual Vacancy, but far more f-words than any other swear word. It's rather funny. I was thinking you could make a drinking game out of it, but everyone would pass out after a chapter or two. Character development is where Rowling really shines and The Cuckoo's Calling was no exception. There were tons of people in this book. We have Cormoran Strike, the private detective; Robin, his assistant; Lula Landry, the victim; John Bristow, the guy who hires the detective...and so many more. Each character is highly flawed. None are entirely likable but also not pure evil. They felt very human. Rowling can convey volumes about a character's personality through the way they dress, the way they carry themselves, their manner of speaking (often expletive laden). Every word on the page is important in establishing who that character is and ultimately in determining who is guilty and who is innocent. Quite a few reviews I've read say that The Cuckoo's Calling never ventures out of the standard conventions for a detective novel. Here's where my unfamiliarity with the genre is beneficial. It all felt fresh to me. Cormoran works his way through every person in Lula's life giving us insight into who Lula was, who her friends and family were, and just how insane the life of a paparazzi hounded star can be. I imagine Rowling drew on her own experiences for the many examples of paparazzi, yes-men, opportunity grabbers, and friend/back-stabbers. It's rather sad. As the mystery unfolds, we also get to know Cormoran. His life is falling apart, but he remains gruff and aloof to readers and co-characters alike, not wanting to show any weakness. Because of this, it was hard for me to grow attached to him, but I couldn't help respecting him. The pacing was slow. It took me a long time to get into the novel, to get invested in the characters and the story. That may be more of a genre thing than a problem with the book itself. Of the detective driven novels that I've read, I've often found them to take a long time to grab hold of my attention. Eventually, I got caught up in the story and the pages turned steadily. At the very end (the last 50 pages or so), I flew through the book but until that point it was even going. As with all good mysteries, there were tons of twists and turns. I did guess the ultimate villain relatively early on, but almost immediately changed my mind. There were strong red herrings planted throughout the book. When it became clear that Cormoran knew who the bad person was, I turned the pages enthralled to see how his reasoning worked. It all made sense and I was totally surprised. Definitely made for a fun ending. The Cuckoo's Calling was a well-plotted novel, had strong characters, and kept me guessing right till the very end. I'd say it was a very good detective novel. I wouldn't say that I totally loved it, but that's because I just don't like mysteries very much. If you do like mysteries or you really like J.K. Rowling, you can't turn this book down. Actually, I feel sorry for Rowling that her pseudoneum has been revealed to badly on twitter. She obviously wanted to stay hidden. She revealed her pseundonym herself, right? At least I read so. The story sounds okay, but not very original..
You want to hear an ironic story? I've put Cuckoo's Calling on display at my library for weeks. It hasn't been touched by a ten ft poll. I came in last week and it was all of a sudden checked out. I thought "Finally, all that promoting and displaying actually worked. Go me!" I went home that day only to find out that the author was JK and the librarian in me was really bummed. Lol, now there are 8 or 11 holds on this book that didn't move and I have to buy additional copies. I was wondering about this one! I kind of wish Rowling had the opportunity to write several more "anonymous" Robert Galbraith novels before that reporter dug up her true name. Glad you enjoyed the book. My mom is interested in reading it. I hope I like the book. I never made it through Casual Vacancy, not because it was so different from Harry Potter but because depressing contemporary fiction really isn't my type. But, like with every book, I won't know if I like The Cuckoo's Calling until I try it. out of curiousity I just quickly checked my library's hold list. for the physical book there are 237 for the ebook only 3. I'm number 3 now. You're really lucky to have gotten this form the library! I don't think people reading this will expect it to be the next Harry Potter either. I don't like mystery books though, so I might pass. After hearing that JK Rowling wrote this, and reading several reviews (yours included) I must read this book. Really enjoyed this review. I'm debating on if I want to read this. I did used to love mysteries, but not so much anymore. But it's JK Rowling and it has received many positive reviews. Buuuut, I'm not sure if I would like all the cynical bits. I like more hopeful books. Awesome snagging that book before everyone else, though! I'm so, so scared to read anything else by Rowling. I'd rather she release another children book for me to compare, but an adult book is way off. Still, I'm curious about both this and The Casual Vacancy, so..we'll see. Sorry I didn't comment earlier - just wanted to finish reading the book for myself before reading any reviews. Glad you enjoyed it, Alison, because I know I did! I was completely surprised by the murderer, as well. What an ending! I think I am more into mysteries than you (and maybe more of a Jo fangirl) so I did end up liking this more than you, no surprise there. I'm actually really enjoying how different her two books have been from HP, surprisingly. It's nice to see so much range! And anything too similar would just be compared. Really great thoughts! If you read the Harry Potter series, enjoying it as much or more so than your children. If you also enjoy murder mysteries; those with well thought out characters, interesting dialogues, the occasional brush with death and, most of all a plot with a conclusion which cannot be guessed at until the very end. If the previous two sentences describe you then I assure you this book will entertain you.